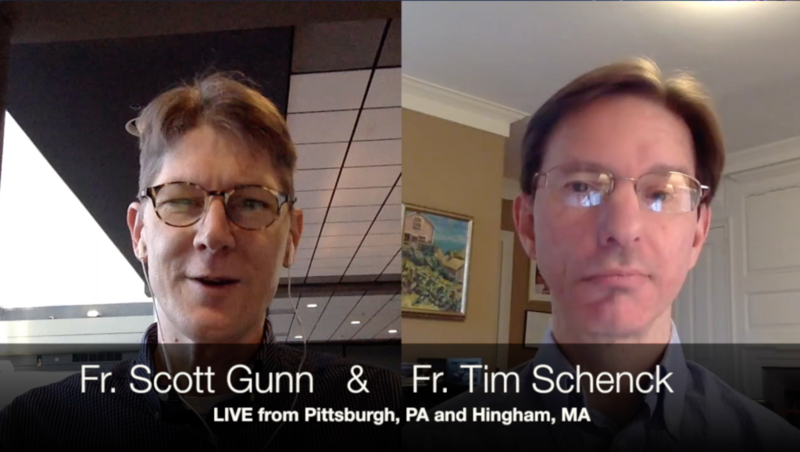 This week, Tim and Scott preview the upcoming Round of the Saintly Sixteen and answer your viewer mail questions. They also highlight a remarkably prescient Lent Madness participant from the state of Washington. Oh, and they announce plans to continue their boycott of the Oscars award ceremony based on the rejection, again, of Monday Madness in the Academy Awards. Remember, we encourage you to consider taking a day off — perhaps several times throughout Lent — to re-watch the entire catalog of Monday Madness episodes. This is here to help social media sharing. 11 Comments to "Monday Madness — March 5, 2018"
SEC succession plans – IRT your latest posting I am deeply concerned that there are no succession plan in place after you go to your rightly and saintly rewards. God willing this will not happen soon as I envision your having Queen Elizabeth, the Head of our Church, lifetimes. Needless to say, when this event does happen. there is an incredible pool of taLENT to choose from. A conclave should be held, with pointy hatted electors draped in red robes and sequestered in the Lentorium under a majority of secret ballots are collected. The masses would gather in the square eagerly awaiting the white smoke billowing from the chimney announcing the election of a new SEC. Habemous Lentors! White smoke? For the Lent Madness SEC? Perish the thought! It must be purple, as must the sacred attire of the holy electors. Any color than purple is unthinkable for Lent Madness! Your name shall be struck from the list of possible successors! I agree that purple is correct! Don’t know where else to post this – but when is one of my top heroes of the faith going to make an appearance? I nominate Jonathan Daniels to make the cut next year. Each week as part of their local Lenten service the Rev. Emily Olsen, preforms a monologue as one of saints competing that week. She’s pastor of Christ the King Lutheran Church, ELCA, Gladwin, MI. Our parish (St. Paul’s Epis) has a covenant relationship with them and share Lenten programs. The Church of the Good Shepherd, Acton MA has for years at our Wednesday morning Eucharist celebrated the life of the Saint of the Day. On occasions it has been a challenge to find one (not that there are few saints around but to find one whose “day it is”). As a last resort if there is no one celebrated anywhere in Anglican Communion or suggested otherwise, I have a book entitled “All Saints” that lists a saint for every day of the year. Some of those listed are our traditional saints but others are people who’ve made a mark somewhere, somehow, sometimes quite controversial and even on occasions not even Christian (a one-time congregant was at one time quite shocked at that), but always worth hearing and learning about. I’m wondering which match-up Father Roy predicted incorrectly.